After being at sea for 16 days, we reached St Helena in the late afternoon of 13 February 2018. The first glimpse of the island appeared as a distant, dim outline partially obscured by cloud. However, as we approached a white cloud-topped black rock arose ahead and then, as we rounded the northern side of island and neared James Bay, the dark silhouette gave way to beautifully lit, barren rock faces, towering up 850m. We were astounded at the jaw dropping, rugged beauty. 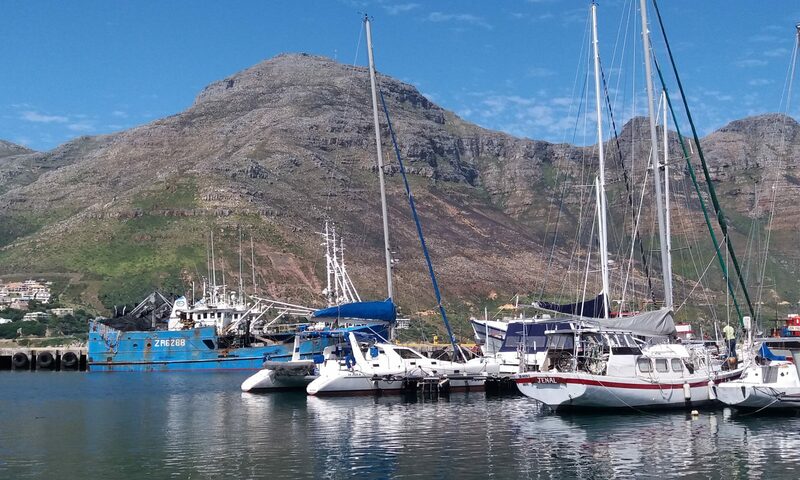 Without doubt the most stressful part of the voyage from Cape Town was getting hooked up to the mooring buoy in the frisky and changeable breeze! Once done though, we enjoyed a peaceful mooring at the far end of James Bay, about 60 m from cliffs that soared 250m above us and were lulled to sleep with the surf sighing onto the rocks and a cool breeze blowing through the boat. We were fast asleep by 21:00, enjoying our first full night’s rest in 16 days! Moored close to the steep cliffs of James Bay. Just after 09:00 the next morning the harbour master and a customs officer came aboard off the local ferry. We could hardly believe that officials could be so friendly and helpful and this welcoming nature of the Saints was confirmed time and again over the course of the next ten days. Going ashore later to clear in and get our medical insurance, we could feel the effects of being at sea for 16 days. It felt as if the earth was moving beneath us as we huffed and puffed up the little hill into town. Jamestown, the capital of St Helena, is a rather quaint village and when I commented on the Country music playing on the radio in the Immigration office, the friendly official admitted that the Saints love that genre. Nestling in a steep-sided volcanic valley this seaport consists of little more than the main street stretching a mile inland, lined with beautiful Georgian architecture and dotted with bright hibiscus and rose bushes. The Main Street of Jamestown. The island is provisioned mostly by sea, by the successor to the beloved Royal Mail Ship St Helena, which completed its last voyage a short while prior to our arrival. Emblazoned onto the harbour cliff walls were ‘Goodbye RMS St Helena’ and it was similarly memorialised outside the local school. We were surprised to be able to shop for a wide variety of items, both provisions and hardware related. However, fresh vegetables and salad greens are hard to come by. ‘The Market’, is one of the beautiful old buildings of Jamestown. A small ferry makes its rounds of the harbour and yacht mooring field each hour, a pick-up being activated by a call on the VHF radio. We used this for the first two days, as we knew that the landing on the wharf could be challenging with the northerly Atlantic rollers. Years earlier Pete’s parents had been disgorged from their dinghy by one of these ‘bad seas’, resulting in broken ribs and a gashed eyebrow after his dad was tumbled onto the rocks. We witnessed just how frighteningly powerful a seemingly innocuous swell could be once it reached the dock, boiling and crashing away amongst the rocks to the left. However, we also realised that by counting the wave sets we could avoid these larger surges. So we pumped up our dinghy and with some trepidation, rowed to shore where we would watch the waves, choose the point on the stepped level wharf at which it would be best to alight and then dash in, me jumping out quickly and tethering the dinghy to the dock and Pete following like a scalded cat! Then we would slide the dinghy ashore, stand it vertically against the cliff face and tie it up. There’s a lot to be said for a light yacht tender and no outboard motor; ours is still unused in an aft lazarette. Nearing the harbour with our dinghy. We learned that of the Saints born here, many later worked for a few years in the UK (St Helena is British Territory) or the Falkland Islands to earn ‘good money’ before they returned to their beloved home. Everybody seemed content and happy and most proud of their island. After a visit to the tourist office we decided to explore the natural beauty rather than the commercialised sites linked to Napoleon’s imprisonment and death. However, boat jobs first demanded attention. When we awoke on day three we saw that a nine storey passenger liner, the Boudicca, had arrived overnight. She only stayed for the day and later that afternoon upped her anchor and with huge, white streams of water jetting in arcs astern, she gave three impressive blasts on her horn and departed. Boudicca anchored behind the private yachts. The absolute highlight of our visit was the opportunity to swim with the largest of all fish – Whale sharks. We took our places on a large inflatable with eight others, going to the north of the island just off the rocky coastline. These fish were plentiful but the trick is to find those that are feeding and thus moving very slowly. Then one is able to swim alongside as they drift along, mouths open, sieving thousands of litres of sea water for plankton, which then disappear down their golf ball sized gullet. After one or two abortive attempts we encountered a placid and apparently curious individual who seemed intent to swim in circles after us, so we had to keep moving to avoid getting closer than the stipulated three metres. This behemoth cruised along in the warm, crystal clear blue water, not bothered by the swimmers. He also played host to perhaps a dozen or more Remora sucker fish which either swam alongside or attached themselves to his bulk. Climbing the 699 steps up Jacob’s Ladder, embedded into the steep valley face, was simply a must-do and we were rewarded with beautiful views of Jamestown and James Bay. View of the yacht moorings with Moondust on the left. Being very unfit after all the inactivity on Moondust, we had to rest periodically and were grateful to reach each 50th step and pause. At the top are the remnants of the Ladder Hill Fort and Battery which used to be the main defensive position on the island, established after the English East India Company founded St Helena in 1659. We did the short hike from town to the Heart Shaped Waterfall and although the falls were dry, it was a pleasant walk, following a path that meandered up the valley through thick bush. Being hot and the road leading back to Jamestown exposed, we were very happy to hitch a ride with a Saint, who told us that there are more cars than the 4 500 inhabitants on this little island. We took a taxi to the starting point of the three quarter hour hike up to St Helena’s highest point, Diana’s Peak National Park. This park covers 81 hectares of endemic Tree Fern thicket and Cabbage Tree woodland and in this surprisingly cool and moist habitat indigenous fern, moss, lichen, grass, and other herbaceous species thrive. The highest peaks are covered in indigenous Tree Fern thicket and Cabbage Tree woodland. Also found on these high peaks are hundreds of hectares of prolific, hardy and tenacious New-Zealand flax, planted around 1900 as a source of income. However, once synthetics were discovered in the 1960’s, flax lost most of its value. The scale of the New Zealand flax plantations is difficult to comprehend. After the national park was founded in 1996, park management made a huge effort to restore this unique habitat through alien plant control programmes and replanting the endemic trees and ferns. From this highest peak we could clearly see the landing strip for the new airport, established on an area of miraculously flat land on the west of the island. The landing strip of the airport is just visible below the distant horison. Astonished by the vegetation in the National Park. Walking back we passed the site where Halley had spent two years studying the heavenly bodies of the southern hemisphere, as well as that of Napoleon’s tomb. It was a long, warm and winding road back to town, so this time we hitched a ride from a Zimbabwean and South African who both worked at the local hospital. Hi Pete and Karin , Fantastic story and pictures . Very sad about the drone . Swimming with whales looked amazing, already looking forward to the next episode . I am sure you are enjoying exploring Brazil . Love Roger and Lorraine . Hi Pete and Karen, I can’t understand how I missed your previous inserts. But once again, you have me mesmerized with great pictures and words, that are absolutely both stunning. Please keep it up! I thought your Ethiopia Trip was good, but for a landlubber, I am gobsmacked. True Adventurers you both are. May Columbus guide and protect you. Thank you very much for your wonderful comment on the blog – apologies for only picking it up now. Glad to hear you are enjoying another adventure with us! Must be special to be for days on the ocean and then slowly see an island approach. Frank, it really was an amazing experience to swim with a Whale Shark! Great blog guys and keep us posted . Looking forward to your Brazil news soon !! Great to hear from you and glad your are enjoying the blog. We plan to stay in the Ilha Grande area for the next three weeks as some of the kids are coming to visit us here. We have just finished our first ‘circumnavigation’ of the Big Island – Moondust sails beautifully. Best to you.